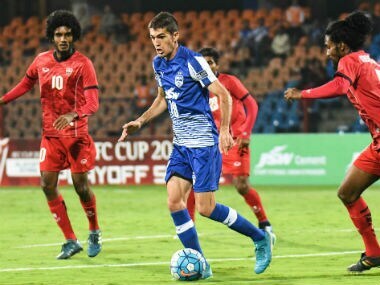 Bengaluru: Bengaluru FC stormed into the AFC Cup group stage with a 5-0 thrashing of Maldives' TC Sports Club, a splendid hat-trick by Toni Dovale laying the foundation for the rout in the second leg playoff on Tuesday. Toni Dovale in action against TC Sports Club on Tuesday. Image Courtesy: AFC official website. The hat-trick goal came after Dovale tapped in a cross from Udanta Singh in the 48th minute, sealing the match with an aggregate of 8-2. Dovale, who became the first Bengaluru player to get hat-trick in any Asian competition, scored his first two goals in the 12th and 35th minute at the Sree Kanteerava Stadium. The other two other goals were scored by Erik Paartalu and Rahul Bheke in 36th and 90th minute. At half time, Bengaluru led 3-0 owing to Dovale's brace. Bengaluru nearly had their fourth goal in the 44th minute as Paartalu missed his brace. He tried to get to the rebound but struggled with the balance as a TCSC defender did well to clear the ball. 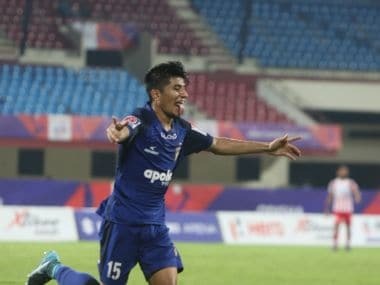 Riding high after qualifying for ISL's playoffs stage, Bengaluru FC asserted their supremacy by regularly foraying into the rival box and picking chinks in their defence. Bengaluru also had their tails up as they had defeated the team in their away game 3-2 last week. 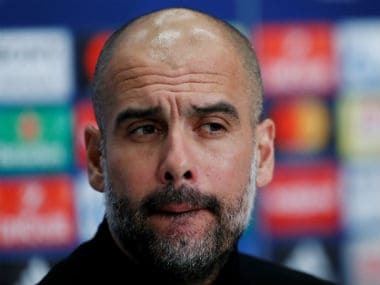 TCSC had a couple of chances though, but could not convert them into goals. Dovale brought the home fans on their feet when he found the top right corner of the net after receiving a pass from Alwyn George in the midfield, giving the hosts their first goal. Dovale smashed an easy one into the back of the net after he received a header from Paartalu, who was assisted by Subhasish Bose with a throw-in. In the very next minute, Paartalu hit a stunner from a 40-yard distance as he volleyed the ball into the top corner, giving Bengaluru a 3-0 lead. Bheke got the fifth goal for his side in the 90th minute after he scrambled into the box and chanced upon to blast into the roof of the net. TCSC too had their scoring chances, but all went in vain.